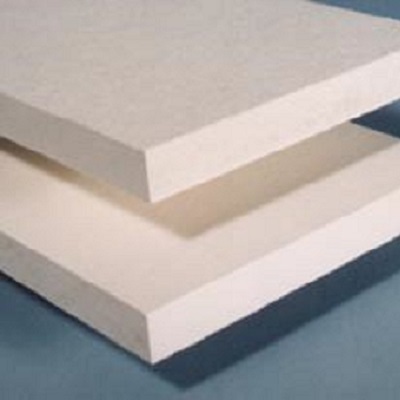 ZIRCEM Refractory Sheet Cement Board | ZIRCAR Refractory Composites, Inc. Type ZIRCEM Refractory Sheet Cement Boards are a self supporting, high strength, rigid refractory product fabricated from calcium silicate, inert fillers and reinforcing agents. Its high structural strength combined with high thermal insulating value make it ideal for many electrical, fireproofing and heat processing equipment applications up to 600°C(1112°F). ZIRCEM boards are highly damage resistant, non-corroding, and extremely water-resistant. ZIRCEM boards are available in full size 4’ x 8’ panels which offer major economic advantages in the construction of ovens, dryers, and other insulated housings for the retention and control of heat. ZIRCEM boards can be readily fabricated into various sizes and shapes for heat baffles and all types of insulating parts. ZIRCEM boards are not affected by moisture or high humidity, and will not rust, rot or corrode. The panels will not disintegrate even after prolonged immersion in water. While the material can be painted if desired, preservative treatments are not required for interior applications. ZIRCEM boards are hygroscopic and electrical resistance is reduced when it absorbs moisture. For electrical applications, ZIRCEM boards components should be thoroughly dried or moisture proofed before use. ZIRCEM boards are monolithic That is oven dried, so it machines into exceptionally fine and intricate parts without delamination. The board is neutral gray in color, and may lighten uniformly with time. ZIRCEM boards require practically no maintenance. The hard, smooth surface does not normally need painting or preservative treatment, but either can be applied if a different aesthetic appearance is desired. ZIRCEM boards can be applied directly to framing members with screws, bolts or mechanical fasteners. These boards are recommended for interior applications only. All bolts or fasteners must be placed in predrilled oversized holes no closer than 1/2″ from any edge. Oversized holes must be 1/16″ or larger diameter for 1/4″ bolts and 1/8″ or larger diameter for 1/2″ or larger fasteners. Bolt heads and nuts must have an adequate washer bearing surface. Applications where vibration or motion exists must utilize rubber or neoprene gasketed washers. ZIRCEM boards should be stored horizontally in a dry, flat area.